When we decided to spend a few days visiting the Chicago area, we approached the venture with a little fear and trepidation, wondering just how we were going to be able to visit the city and learn how to get around. Fortunately, we got off the interstate when the sign directed us to Indiana Dunes National Lakeshore and stopped at the visitor center before trying to find a place to spend the night. The ranger there was very helpful, and said that there were still a few sites in the campground (It was nearly 6 pm). We told him we wanted to visit the city, and he informed us that the South Shore train had a station stop within walking distance of the campground! What a lifesaver! He gave us a train schedule and we proceeded to make plans to take the train all the way to the end (Millennium Park) on the day we wanted to visit downtown, or I should say “the loop.” Since the campground is part of a national lakeshore, we were able to get our site for the senior half price, $9.00 a night. We nabbed one of the few remaining sites, then went out to visit the adjacent lakeshore. All sites are first come, first served, and are available starting at 9 am each day. Usually there are people waiting at the gate in the morning for a chance to get a site (on the weekend, at least). Payment is by credit card at an electronic machine check-in. The campground does not have electricity available, but it does have hot showers and water and a sewage dump station available. And, since two cars and two tents are allowed on each site, it would be possible for one or both of our Michigan children’s families to camp with us there and we could still get the senior rate. The campground is not in the city, but don’t plan to camp there unless you don’t mind the sound of trains and traffic from the interstate. The sounds are not overwhelming, but they can be heard from a distance. The campground is very convenient, however, if you plan to visit Chicago. The train trip takes an hour and a half and for seniors the special rate is $4.00 each way, which is less than gas would cost. We packed a lunch to take with us on the train, and took advantage of free tours at the Chicago Cultural Center, which used to be the public library, built in 1895, twenty years after the Great Fire. They give free walking tours of Millennium Park and The Loop. There is also a 15-minute tour of the building itself, which boasts not one but two Tiffany domes, and many Tiffany mosaic adornments on walls and ceilings. There is also an area where internet service is available. The building is very easy to find, since it is right at the top of the ramp coming up from the train at Millennium Center. 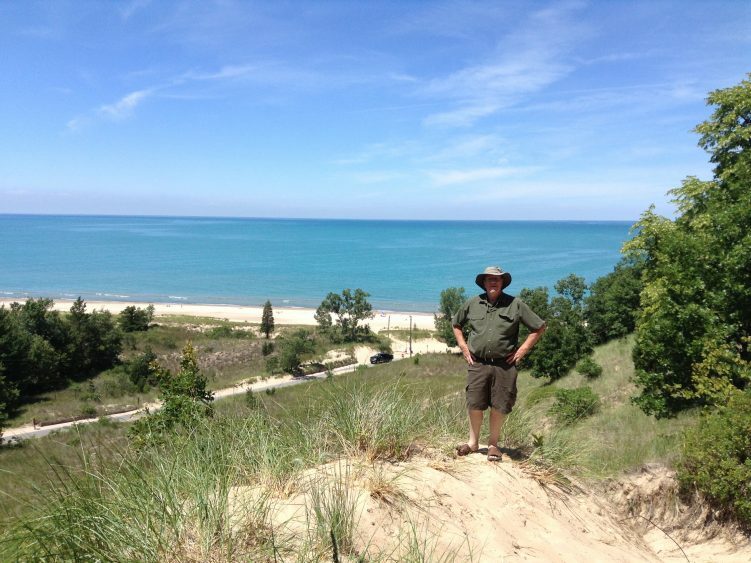 We would love to visit Chicago again, and if we do, we will definitely stay at Indiana Dunes!